June 28th through the 29th... those are the dates that SMi's MilSatCom USA conference will occur in Arlington,Virginia. This highly popular defence conference will provide the latest updates on the MILSATCOM programs of the UK, Canada, Spain, France and NATO. A dedicated spotlight session on International Allied Collaboration and Perspectives is one of the highlights of the conference. The keynote address, entitled "The Importance Of Allied Cooperation In MILSATCOM," will be offered by the US Air Force (USAF) International MILSATCOM chief, Deanna Ryals. The focus of her presentation will be the importance of understanding allied requirements early in the acquisition process and how to bring allies into existing nexgen MILSATCOM. MilSatCom USA 2016 includes more than 18 unique presentations delivered by leading experts in the field who will address key aspects of protected SATCOM—protected tactical waveform, jam resistance, low probability of intercept, the integration of commercial SATCOM for military communications and more. Updating attendees on US Department of Defense (DoD) international relationships will be Michael T. Laney, Lead, International Engagement for MILSATCOM, USAF. More than 150 attendees are expected to attend this conference in Arlington this coming June. The guests will represent key government and military arenas, as well as industry leaders, from across the US Armed Forces as well as the UK, Canada, Spain, France and NATO and many more. The audience will include, but is not limited to: Directors of J6, Heads of Space Branch, MilSatCom Programme Managers, Heads of C4ISR, Directors of Network Services, Heads of Space Policy. 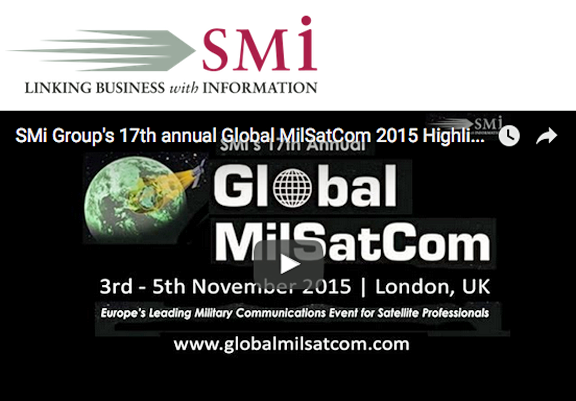 MilSatCom USA is sponsored by Hughes Network Systems, Intelsat General and O3b Networks. All active U.S. Government, U.S. Military and Law Enforcement Personnel will be granted free admission to the event. However, in order to attend this event, pre-registration is required, which is subject to final approval by SMi Group. A special discounted rate to Foreign Government, Foreign Military and Law Enforcement Representatives, is also offered. For further information, please email jhitchen@smi-online.co.uk.